No, I'm not starting a new theology blog. They'll have to pry DET out of my cold dead fingers with a crowbar before that happens. But other theo-bloggers are not so sedentary as am I. Case in point, a number of theology bloggers (at least one of whom has contributed to a Barth Blog conference here at DET) associated with the doctoral program at Aberdeen (and one guy who was here at PTS for a while) have recently shuttered their respective blogs (for all practical purposes) and started a new joint venture entitled, Out of Bounds: Theology in the Far Country. You'll definitely want to keep track of this blog. As of this typing, there are two introduction posts up. A prophecy: The word of the Lord to Israel through Malachi. “I have loved you,” says the LORD. “But you ask, ‘How have you loved us?’ Was not Esau Jacob’s brother?” declares the LORD. “Yet I have loved Jacob,  but Esau I have hated, and I have turned his hill country into a wasteland and left his inheritance to the desert jackals.”  Edom may say, “Though we have been crushed, we will rebuild the ruins.” But this is what the LORD Almighty says: “They may build, but I will demolish. They will be called the Wicked Land, a people always under the wrath of the LORD. You will see it with your own eyes and say, ‘Great is the LORD – even beyond the borders of Israel!’  A son honors his father, and slaves honor their master. If I am a father, where is the honor due me? If I am a master, where is the respect due me?” says the LORD Almighty. Karl Barth was a Reformed theologian, without a doubt. He purified Protestant theology according to its own best insights, to be sure. But we Protestant readers of Barth often forget just how ecumenical his vision was, something that Roman Catholic and Orthodox readers of Barth are quick to pick up on. Indeed, I helped with George Hunsinger’s intro to Karl Barth class this past semester, and had an Orthodox student who constantly reminded me of this - it was quite interesting to get a glimpse of Barth through her eyes. Well, it's all over now. And to be perfectly honest, I'm glad - I have a dissertation that needs finishing, ASAP! But, today's conference presentations kept things moving, and the panel was a lot of fun. First, some links: here are my discussions of Day 1 and Day 2. But, I'm no longer the only game in town. Matt Frost (who I have enjoyed getting to know at the conference) and Nathan Maddox both have stuff up. Broaden your horizons and check them out. There was a single "regular" session this morning, on the topic of Divine and Human Action (As an aside, I'm immensely disappointed that there was no session on ecclesiology; one would think - and would be correct in assuming - that this is not an insignificant matter in an ecumenical engagement). Day 2 did a fine job keeping pace with the first day, and the combination of a great conference and too little sleep is starting to get to me. But, it will be back to the dissertation grind tomorrow afternoon. Wow. That was quite a day. There were two sessions today, each with one speaker from the Roman Catholic side and one from the protestant side. The first session was on divine being, and Robert Jenson was the first speaker. He began by highlighting the strangeness of Barth’s doctrine of God, especially his use of the notions of decision and event to do the heavy duty metaphysical work generally done by the notion of essence. But at every juncture Barth tries to get us to turn our attention away from the lanugage that we use and toward the encounter with God as and where it occurs. The post title pretty much says it all. Those who did NOT have obligations at home - say, helping put their 2 boys to bed - were treated to some opening statements this evening by Bruce McCormack and Thomas Joseph White. Another PTS blogger has provided some coverage of this at his blog. For my own part, I caught up with some good folks at one of the after parties. The best part of these conferences is the high quality of informal theological conversation, and I started it off right this year with a confab with some quality folks. I'm looking forward to some good papers and some more good conversation tomorrow. 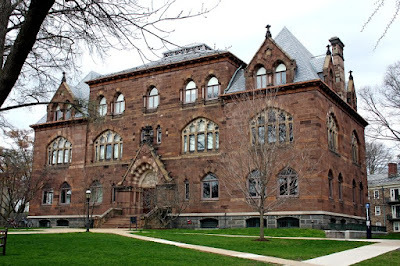 So, I’m putting this post up a day early because this year’s Karl Barth conference at Princeton Theological Seminary begins this Sunday. I’ll be there, and I look forward to doing some good mingling with folk while taking in some good lectures. It is not inconceivable that this will be my last Barth conference for a bit, so it will be a little bittersweet. In any case, I’ll try to blog it a bit. Also, if you're planning to be at the conference but haven't told me to keep an eye out for you yet, please do! In his treatment of the back-and-forth between Barth and the Pietists in the 1920s, Eberhard Busch notes that one of the main criticisms the latter leveled against the former was that he failed to be sufficiently biblical, or sufficiently faithful to Scripture (to put the same basic point two different ways). Busch analyzes this criticism, and the problems that he points out in the Pietists on this point are instructive to all who would do theology in conversation with Scripture. Below I sketch Busch’s analysis. Eberhard Busch, Karl Barth & the Pietists: The Young Karl Barth’s Critique of Pietism & Its Response (Daniel W. Bloesch, trans. ; Downers Grove, IL: InterVarsity Press, 2004):217-25. Donald Norwood has a new review up at the Center for Barth Studies website dealing with D. Densil Morgan's Barth Reception in Britain. Also, there are now links to the upcoming Princeton Barth Conference on the main Center for Barth Studies page. So, surf on over to get the pertinent information. I hope to see many of you at the conference. I was planning to write my own brief recap of the volume’s first part – the historical survey of Christian thought about happiness – but then I saw that Dr Charry wrote one herself. So, I’m just going to quote her. Following this lengthy quotation, I’ll highlight a few particularly good lines from the first ~150 pages of this work. Also, I should mention here that you can download the audio of Dr. Charry's recent inaugural lecture at PTS, as well as watch a short video clip - just click here! Dr Charry recaps much of her material on happiness in that lecture. The news has been leaking slowly over the past few days, but everything is 100% official now and so I wanted to state publicly that I have accepted a position as assistant professor of religion at Lindenwood University. It goes without saying, but I’ll say it anyway: I’m very excited to assume this position and get on with the task for which I have been training for the last decade. It should also go without saying that my wife is very happy that I am finally gainfully employed.